I was browsing at the bookstore the other day and meandered over to the parenting section. I occasionally find myself searching this section for any new and interesting titles. I figure I can use all the parenting help I can get. But the truth is, I rarely ending up buying any of the books. I've discovered something. Although I'm far from an official child-rearing expert, I've, through trail and error, become pretty good at raising my own kids. So I've been thinking about what I've learned in the past four years as a mother as I get ready to add one more member to our family. I've made my fair share of mistakes, that's for sure. 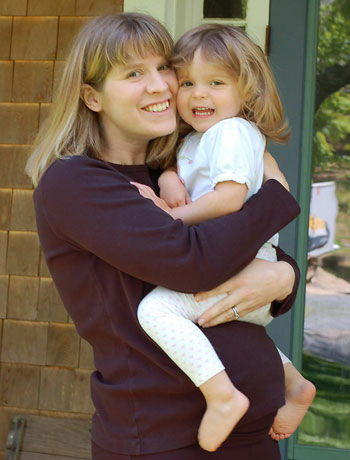 For instance, after co-sleeping with Julia for the first six months of her life (and then on and off again until she was three), I was confident that it was safe to do the same with Elise. However, I learned a valuable lesson when she was just a week old. Shortly after I had finished nursing her, I was trying to comfort her to sleep. So I laid her on my chest. A short while later she started to stir, and I rolled to my side so I could lay her on the bed to nurse. Or so I thought. In reality I had been dreaming. Elise was still asleep on my chest. I had fallen asleep. And when I rolled, Elise rolled too and fell off the bed onto our hardwood floors. The loud thump followed by Elise's screaming jolted both Nelson and I awake. It was the worst moment of my life. I was sure I had done serious harm. Thankfully Elise was just fine. But I kept reliving the moment over and over again for weeks afterwards. And I also went right out and purchased a co-sleeper bed to ensure I would never make another dangerous mistake like that again. I realized that I was far more exhausted raising two kids than I had been when it was just Julia. I also realized that my own sleep needed to become a priority. From that point on, I became stricter about sleeping habits and routines with Elise. And to this day she's a good sleeper because of it. 1.Breastfeeding is absolutely worth it, but a bottle of formula isn't so bad either. 2.Exercise and fresh air is vital to help fight post-partum blues, stress, and fatigue. 3.Babies really don't need a lot of stuff. To this day, my girls still prefer our kitchen pots and pans to just about any toy we own. 4.My first priority as a mother is safety. While safety gadgets are overrated in my opinion, diligence as a mother is not. 5.It's never too early to teach your child how to say please and thank you. 6.Stay the course when serving healthy meals. Eventually your baby/toddler will eat. 7.Don't stress over making your own baby food. There are wonderful prepared varieties. 8.I know everyone says it, but it's true: read to your baby. 9.Celebrate birthdays and milestones with your family and friends as much as possible. There's nothing like a party to bolster your spirits. 10.Every day ask yourself: What legacy are you leaving today? And then try to live up to your expectation. You won't always do so great, but at least you'll have something to aim for. But most importantly, forgive yourself when you make mistakes, because you'll make lots of them. Trust me—I'm an expert!